Following the U.S premiere of her animated Fluid State, which visualizes the creation of matter in a fictional landscape, artist Alyson Shotz has adapted her installation The Geometry of Light for the Indianapolis Museum of Art’s Efroymson Family Entrance Pavilion Series. Shotz—who is recognized for exploring the physical world by engaging with concepts of light, gravity, and space—uses industrial materials such as stainless steel wire, silvered glass beads, and cut Fresnel lens sheets to form a sculpture that considers the duality of light as both particle and wave. 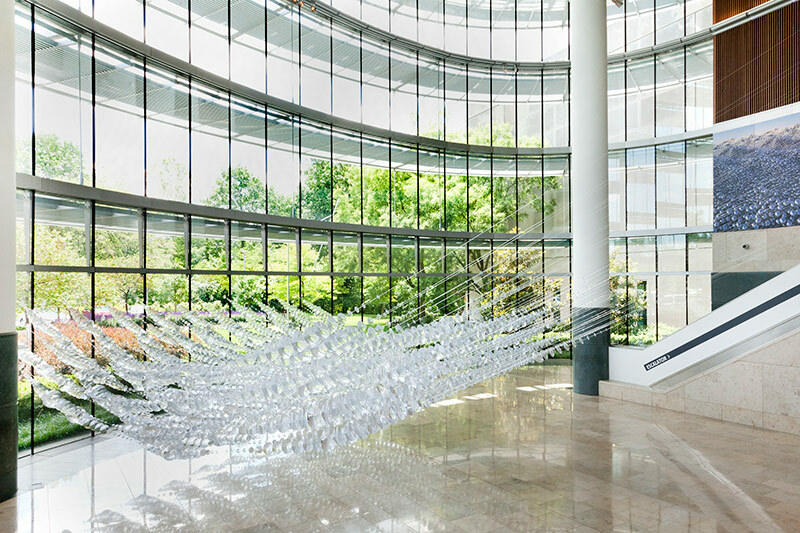 During daylight hours, natural light filters through the lens sheets, and the varying angles bring life to the piece as the position of the sun changes throughout the day. By moving through the room, visitors perceive how light and motion shape the experience of space.